From the New York Times bestselling author knighted by the President of Italy for her writing, a jubilant exploration of how Italy transformed the Western world’s most vibrant passions—from literature to art, music to movies. No country has matched Italy’s impact on culture. Just think of painting without Leonardo, opera without Verdi, fashion without Armani, food without the signature tastes of pasta and pizza. The first universities, first banks, first public libraries? All Italian. Dianne Hales attributes these landmark achievements to la passione italiana, a primal force that stems from an insatiable hunger to discover and create; to love and live with every fiber of one’s being. This fierce drive blazes to life in the Sistine Chapel, surges through a Puccini aria, and rumbles in a gleaming Ferrari engine. 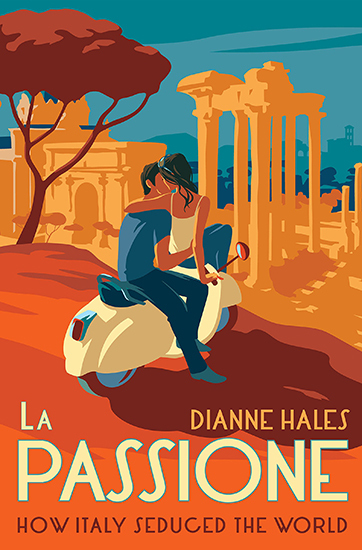 Our ideal tour guide, Dianne sweeps readers along on her adventurous quest for the secrets of la passione. She swims in the playgrounds of mythic gods, shadows artisanal makers of chocolate and cheese, joins in Sicily’s Holy Week traditions, celebrates a neighborhood Carnevale in Venice, and explores pagan temples, vineyards, silk mills, movie sets and fashion salons. In sumptuous prose, she introduces us to unforgettable personalities brimming with the greatest of Italian passions—for life itself. A lyrical portrait of a spirit as well as a nation, La Passione appeals to the Italian in all our souls, inspiring us to be as daring as Italy’s gladiators, as eloquent as its poets, as alluring as its beauties and as irresistible as its lovers.